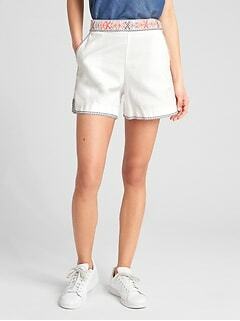 Enjoy warm weather, fresh air, and good friends in Gap women's high waisted shorts. Add a new pair of women's high waisted shorts to your wardrobe today. At Gap, you'll find an assortment of modern, chic designs that are easy to work with and fun to wear. When the mercury starts to rise, you'll want a flattering pair of shorts to make the most of the outdoors. Stroll through the park with your special someone, hang out on the boardwalk with friends, or run errands on Main Street. These classic garments are both timeless and on-trend. They are tailored to give definition to the natural curves of your body, and are perfect with a tucked in top. From 3" short shorts to 12" Bermuda shorts, there's something for everyone's tastes and style at Gap. Choose from an array of colors, including pristine white, vivid pastels, iconic blue denim, and shorts that feature always popular stripe patterns. Whether you're looking for one fabulous pair to complement your entire wardrobe, or totally reinventing your closet, you'll appreciate the variety in this impressive line. The shorts in this line will make your old favorite blouses, tanks, and tees come to life, and serve as wonderful platforms for creating a completely fresh outfit. Discover the difference high waisted apparel can make for your wardrobe today. High waisted clothing from Gap is modish and here to stay. You'll find yourself going back to these amazing garments year after year. Wear them with sneakers, sandals or booties. Tuck a fitted shirt in, or wear a flowy, bohemian-style shirt on top. Craft a casual-chic look that's ideal for a date at the drive-in, or enjoy a comfortable outfit for chilling out at home with your family. These designs are expertly tailored for a modern slim look and a comfortable fit. Start experimenting with high waisted garments today. You'll find they show off your curves in all the right ways. Enjoy a lightweight airy fit from these premium clothes. Browse this diverse collection of women's high waisted shorts from Gap and find the perfect pair for you.